For 22 years Roberta Avila has worked in the non-profit and social justice sectors. She has served as the Executive Director of STEPS since July, 2009. Four years prior, she held the same position with the Mississippi Coast Interfaith Disaster Task Force. Roberta Avila is also a founding member of the Gulf Coast Fair Housing Center and currently serves on boards for both the Mississippi Immigrant Rights Alliance (MIRA) and the Mississippi Center for Justice. Both of Roberta’s parents immigrated to the United States from Mexico. Her mother, Carmen Montez, was an infant at the time she was brought here and her father, Marcos Trinidad Avila, was in his teens. The two met in southeastern Colorado and married. They first lived in a community outside of Las Animas, Colorado known as “La Colonia”, the colony, which is where newly arriving immigrants settled. The homes were quite small, one or two rooms constructed of adobe. Everyone did seasonal farm work. Carmen was fortunate to get a job in a hospital in Las Animas. Her formal schooling ended in the 4th grade, but through on the job experience at the local hospital, she earned a certificate as a licensed practical nurse. This permanent, full time job afforded the luxury of being able to stay in one place. Marcos and Carmen did not have to uproot themselves, as migrants with every season in order to find work. The Avila’s were kind and giving people and did what they could to lessen the hardships endured by new arriving immigrants. Carmen gave birth to twelve children! The family consisted of nine girls and three boys. Roberta is number ten in the birth order. While raising the children, Carmen held down one, sometimes two jobs, in order to make ends meet. Marcos continued to do seasonal farm work, which sometimes meant traveling to other states. While Spanish was spoken in the home, all of the Avila children were expected to learn English and to be well educated. “My parents understood that a good education was the ticket to better opportunity for their children and they encouraged us to do well in school and attend college. Seven out of twelve children earned college degrees with the help of scholarships and college loans. Roberta’s interest in social justice issues began during her youth. Her brother, Magdaleno, who is five years her senior became her mentor. He was the first social activist in their family. He went to college in California and while there began working for the United Farmworkers Union, which was organizing for basic human rights for farm workers. He organized farm laborers after returning to Colorado and Roberta would accompany him at meetings, marches, and peaceful demonstrations around workers’ rights. It was only a matter of time before Roberta would embark on her own quest to address social injustice. When Roberta left Colorado, she went to Gainesville, Florida and at the University of Florida helped to organize “Students for Farm Workers,” following in her brother’s footsteps. At that time there was a strike against some iceberg lettuce growers and a huge boycott was in progress against Gallo Wine. Roberta and her fellow students stood at the entrance of grocery stores with fliers asking customers to boycott these products until fair wages and better working conditions could be negotiated for farmworkers. The women’s movement and rising feminist consciousness were also in full swing in the early 70’s and Roberta became an advocate for women’s rights. “I joined with the National Organization for Women in their effort to ratify the Equal Right Amendment,” she said. Roberta’s first marriage took her to West Point, Mississippi. The closest university was Mississippi State in Starkville where she attained a bachelor’s degree in Liberal Arts and later a Master’s in Family Counseling. “Mississippi State was not a hot bed of activism like the University of Florida, which was kind of disappointing. I continued to actively support the Equal Rights Amendment on campus,” Roberta said. She drove to Chicago and participated in an Equal Rights Amendment march of thousands in the last real effort to get three more states to ratify the ERA, but it failed. Her graduation from State and new work brought her to the Gulf Coast in 1983. Roberta married a second time in Biloxi in 1990 to realtor Milton Grishman. When they married, the prospect of having their own children was not in their plans. Fourteen years later everything changed. Roberta’s niece in Colorado had two children, but became unable to care for them. Milton and Roberta made the decision to care for the children and bring them into their home. “We didn’t know at that time whether they would remain with us permanently, but it was important to keep them in our family. We have been parents to the children for 9 years now,” Roberta said. A legal adoption of Alyssa and Brandon will be finalized by the end of this summer. “The adoption affirms our commitment to them as our children. The children have brought us great joy and we are thankful they came into our lives,” said Avila. 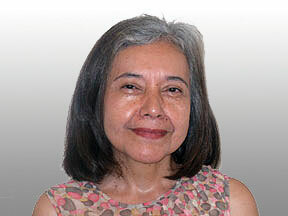 Roberta Avila is one of the founding board members of the Mississippi Immigrants’ Rights Alliance, (MIRA). She and Bill Chandler, Executive Director of MIRA, had in common their work with the United Farm Worker Union. When Roberta first came to the Coast in 1983, there were very few Hispanics living here. When Chandler organized MIRA, there were a growing number of immigrants moving into Mississippi and the numbers increased following Hurricane Katrina. “Many Hispanics who came to help with the repair and rebuilding of the area were legal citizens, but many were not,” Roberta said. Workers were being short changed on their pay and sometimes were not even paid at all. MIRA advocated for fair and decent wages for all. MIRA also assisted with paperwork for visas and filing for citizenship. “I am very proud of the work MIRA has done to prevent some very anti-immigrant legislation in Mississippi. MIRA has been very effective in advocating for local immigrants as has El Pueblo, another Coast non-profit led by Jennie Searcy. “These agencies have made a tremendous difference in the lives of immigrants,” Roberta said. “I think about my parents who came to the US when borders were more porous. They experienced challenges that any new immigrant faces here. But they didn’t face border patrols and there was no law barring them from immigrating. Many new immigrants found it too difficult to continue work here and have returned to their country of origin, but those who have stayed are eager to become legal citizens of the United States. Avila maintains that immigrants are generally hardworking people who set high goals for themselves and want to be productive members of society. Their children often excel in school, intend to go to college, and attain a degree. The STEPS Coalition was formed after Katrina with the purpose of mobilizing social justice organizations around the recovery. STEPS organized its work under five social justice pillars: economic justice, environmental justice, affordable housing, preservation of historical communities and human rights. The coalition, made up 35 social justice organizations, became a voice for not only immigrants, but the elderly and people with disabilities. STEPS motto is “Creating Communities Worth Calling Home.” “We support new initiatives that fall under our five social justice pillars and that are driven by community members. We provide training and build leadership capacity for community groups to advocate for what is important to them. This was the first time ever on the Coast to have a social justice coalition formed by local organizational leaders. “STEPS support economic development that does not compromise local neighborhoods and the environment. Balance is key,” Roberta said. Partners for a Safe and Healthy Port, an initiative of the Steps Coalition, is an example of the balance that STEPS strives to achieve in its work. STEPS became involved in the Port of Gulfport restoration and expansion when U.S. Housing and Urban Development (HUD) agreed to redirect $600 million in Commmunity Development Block Grant (CDBG) funds, intended for housing recovery, to the Port of Gulfport. “As soon as we learned of the planned diversion of funds we launched “People Before Ports” advocating that all who had housing recovery needs should be helped first, before money was redirected to the Port,” said Avila. “To receive the CDBG money the Port of Gulfport told HUD they would meet a national objective of job creation. However, it has new been three years since the Port received the funds and no jobs have been created and $118 million has been spent,” said Avila. While jobs are important to the member organizations in the port campaign, they have been vocal in demanding that their historic neighborhoods do not bear the brunt of the Port expansion, which includes a port connector road and inland port. Again, this is an example of how there must be balance. There are solutions to the problems, but the affected community must be at the table and they must be heard. The best community economic development happens when local communites have a say about how the development will impact them,” said Avila. A new initiative of the Steps Coalition is the Concerned Citizens/Taxpayers Coalition, which has come together to voice concerns about a $21 million bond issue the city of Biloxi is considering to finance a ball park. This is a fiscally conservative group that is asking that city leaders rely on an economic analysis to determine if such a project is likely to be financially successful. “It’s one thing for a private investor to take the risk, but it’s another when you ask the citizens of Biloxi to bear the risk. The coalition is asking for transparency and the participation of community members on any plan for a ball park.” Roberta said. Go To Places Monthly is proud to honor Roberta Avila is our Mover and Shaker figure for the month of August.